‘Fruit below the middle size, of a roundish figure, rather narrower at the crown than the base. Eye small, a little sunk. Stalk half an inch long, slender. Skin pale yellow, marked with various ramifications of a grey russetted network, interspersed with a few dark-coloured specks; when fully exposed to the sun it is of a beautiful brilliant red, extending nearly round its base. Flesh yellowish white, firm, crisp. Juice sugary, with a singularly musky perfume. A dessert apple from November till February.’ [George Lindley – Orchard Guide p.39/1831]. ‘This, above all other apples, is the most highly esteemed in Germany. Diel calls it the Pride of the Germans. It is believed to have originated either at a village of Misnia, called Borsdorf, or at a place of the same name near Leipsic. According to Forsyth, it was such a favorite with Queen Charlotte, that she had a considerable quantity of them annually imported from Germany, for her own private use. It is one of the earliest recorded varieties of the continental authors, but does not seem to have been known in this country before the close of the last century. It was first grown in the Brompton Park Nursery in 1785. It is mentioned by Cordus, in 1561, as being cultivated in Misnia; which circumstance has no doubt given rise to the synonyme "Reinette de Misnie;" he also informs us it is highly esteemed for its sweet and generous flavor, and the pleasant perfume which it exhales. Wittichius, in his "Methodus Simplicium," attributes to it the power of dispelling epidemic fevers and madness!’ [Hogg p.41/1851]. Described and figured in the Herefordshire Pomona [HP pl.III/1878]. 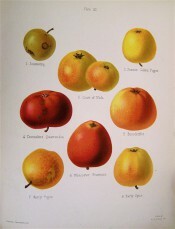 ‘Borsdorfer’ is listed as apple no.68 in a hand written list of apples in an 1850 catalogue held at Camden Park [CPA]. ‘Queen Crab’ is listed as apple no.74. It could be ‘Queen Apple’, a synonym of ‘Borsdorff’, as I have found no reference to ‘Queen Crab’. ‘Borsdorff’ is a small yellow apple that could well have received the appellation ‘Crab’. Most of the plants hand-written in this catalogue subsequently appeared in the 1857 catalogue. That the apples did not is probably an oversight.